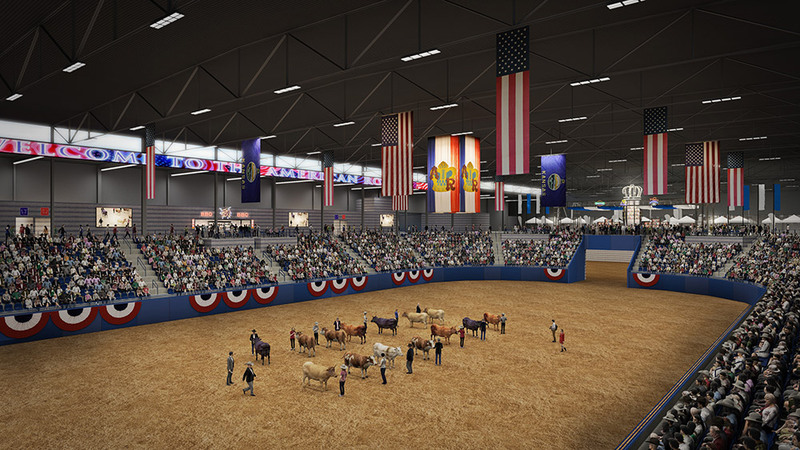 The American Royal complex will be a modern, state-of-the-art, purpose built, events facility designed for ALL. As the American Royal looks into the future, we recognize a strong found ation and a tradition that must live on. It is the American Royal's goal to increase overall exhibitor participation and grow the spectator and visitor experience. However, current limitations exist with a regard to facilities and attraction of new events. To grow as an organization and a nationally recognized brand, we must move to a new location. While keeping the tradition alive, the need for more space sparked a disruptive new idea that will bring the organization to new heights, will elevate the Kansas City region's prominence in agriculture, and will make an impact around the world. The American Royal complex will be the ideal location for a variety of food and agriculture events. With growth of existing events and additional versatile space for expanded opportunities, the center will be a destination for people of all ages, backgrounds and cultures. The events facility will be larger in size with more space for exhibitors, vendors and spectators. Design features are being carefully considered to provide a home for competitive events and gatherings like none other. More than ever before, consumers seek to understand and influence how food is produced. The American Royal is excited to share that story and create a learning experience unlike any other, inspire today's youth to pursue careers in the industry, and serve as a trusted voice and respected resource. Integrated agricultural learning for all ages will instill a heightened level of understanding and will ignite discovery and excitement around every corner. You know what Silicon Valley and Wall Street are. Similarly, the surrounding campus around the American Royal will serve as an hub for agriculture, attracting food and agriculture industry leaders, associations, technology, and entrepreneurs. This campus will allow for industry partnerships, foster entrepreneurial spirit, and attract and develop industry talent. Discoveries will be made here and people will be empowered. It will be a place to showcase great minds and ideas. *NOTE: NOT ALL FEATURES LISTED. ALL SUBJECT TO CHANGE.